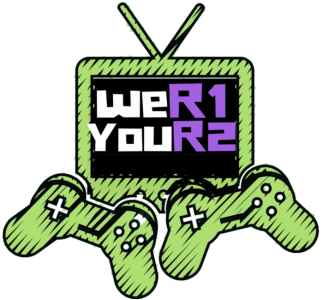 Hello and welcome to weR1 youR2 Games, a podcast and video game entertainment company where we R1 community of gamers, and you R2 (get it, Playstation, triggers, haha?). We were founded by Rob Fanzo in January of 2018 who decided to begin his year by pursuing his passion to create a community oriented podcast around the medium he loves, video games. It was a side project, but it has since grown. He made one episode to put out in the the vast space of the interwebs, and after one episode he gained both an audio man and a co-host. Here we are now, with a staff consisting of his co-host Matt Rhoads, Audio engineer Dave Gerritzen, and website editor, John Gerritzen. To learn more about each of these men, scroll to the bottom. So, that’s our brief history, but what do we strive for every week in the content we make? We started this endeavor to bring you a professional podcast about the games you care about, the Playstation system you care about, the video games you care about. We imagined this becoming a place where, although we unabashedly are Playstation Fans, we could show love to Xbox, Nintendo, and PC Gamers (most of the time;) ). We created this company under the concept of being all about community. Community means connecting with you via email, Twitter, Instagram, and anywhere else you see fit to have us hear your voice. That also means covering the games you love based on your feedback, as well as the ones you might not expect to love. It means we bring you plenty of coverage on the triple A guys, but show you how they are inspired by the innovators in the indie game scene. We want you to see this all through our podcasts, our Youtube channel, and all the content and interviews we share. The goal will always be to bring you a quality podcast about video games, but to also bring you news, reviews, let’s play videos, anime talk, wrestling talk, and anything else that strikes our interest. Our mission is simple: share our love of games with you. Share the inside world of gaming with you through developer interviews, voice actor guest stars, writers who write about games, and all the media personalities we can muster up to see what it is like to talk to these people as fans, not just another press outlet (even though, we are, by all accounts, one). Sound good? We thought so. WE want to represent YOU and make this a community where you have the voice. So, if you like what you hear, consider supporting us on Patreon so we can make this your gaming community, where WE R1 community and YOU R2!